The following article provided courtesy of Gibson. 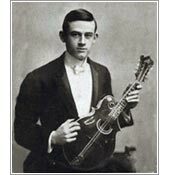 A virtuoso classical mandolinist and acoustical engineer, Lloyd Loar joined Gibson in 1918 but left shortly thereafter to go to Europe with the AEF (American Expeditionary Force) and returned in May of 1919 to go back to work at Gibson. Loar's refinements of Orville's orginal carving concepts brought about the Master Model F-5 mandolin and L-5 guitar, with tuned tops and backs. The F-5 was quickly judged the finest mandolin ever built, while the L-5, in the hands of players like Eddie Lang, became the first guitar to take a serious role in the orchestra. It quickly replaced the tenor banjo as a rhythm instrument and became the basis for Gibson's dominance in the new field of arch top guitars. The 1920's saw another period of incredible innovations including bridges with height adjustment, elevated fingerboards, and Thaddeus McHugh's adjustable truss rod, patented in 1921. Simple and direct in operation, the truss rod balanced the tension of the strings on the neck and kept the neck in perfect alignment. The 1920's also saw Gibson develop banjo concepts like the modern tone ring and resonator which revolutionized the tenor banjo of its day and laid the foundation for Earl Scruggs and Bluegrass music 20 years later. By 1924, Loar had a prototype of an electric bass with a strong design emphasis on the pickup, strings, and little else. Anticipating a sound and market by almost 30 years, Loar's radical design was not accepted by Gibson management or the public and he resigned in 1924. It was the first example of Gibson engineers being far ahead of their time.